Free Shipping Included! VIPER Winch 12000lb, Steel cable, wireless remote, integrated contactor by MotoAlliance at Lazaranda Dallas. MPN: VX12000_ST. Hurry! Limited time offer. Offer valid only while supplies last. The VIPER Classic 12,000lb Recovery 4x4 Truck Winch is perfect when needing a durable winch for Jeeps, Tow Trucks and all Recovery vehicles. The VIPER Classic 12,000lb Recovery 4x4 Truck Winch is perfect when needing a durable winch for Jeeps, Tow Trucks and all Recovery vehicles. Constructed with permanent magnet motors and steel gears, the Clasic 12,000 winch delivers a reliable performance that users recognize and trust. Fully sealed with a planetary metal gear train, it is heavy duty and includes all the features and extras that users recognize and trust. 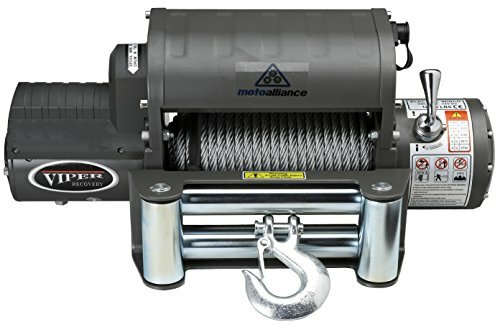 Backed by a Limited Lifetime Warranty and toll free customer service line, this metal bodied winch has a standard mounting bolt pattern of 10" x 4.5". MotoAlliance warrants to the original purchaser that VIPER Classic 12,000 winch (a) mechanical components will be free of defects in material and workmanship, and (b) electrical components will be free of defects in material and workmanship for a period of one (1) year from purchase. Mount Pattern: 10" x 4.5"